Recently I got a mail from Native Food Store – An Online millet stores in Chennai, to try their millet products and share few recipes with them. I visited their website Nativefoodstore.com and found wide range of millets and their products like Instant millet mix, millet flour, millet flakes, millet noodles and many more. Rates are also reasonable when compared to other online stores.I found millet noodles, millet flakes are interesting and new to me. So I decided to try it and asked them to send me the products. As I haven’t shared any millet recipe in my blog for long time, I wanted to take this as a chance to make varieties of millet recipes in my kitchen and share with you all. My contact at Native food store was very much responsive and sent me the products immediately.They sent me Samai/Little millet noodles, Kuthiravali/Barnyard millet noodles, Varagu/kodo millet noodles, thinai aval /foxtail millet flakes and Kambu aval/ Pearl millet flakes. I tried Samai veg noodles recipe for the first time in Indian style. They had also given their own tastemaker masala along with the noodles just like Maggi and other branded noodles. As its my first attempt, I just followed the recipe given in the packet, added all the colorful vegetables and made this millet noodles for our breakfast. It came out really well and I couldn’t find any difference in taste, color or flavor from our regular, plain noodles.We loved it to the core. I feel the tastemaker does the magic to the recipe. It can be prepared in less than 15 minutes. So bachelors and working women can make this healthy as well as quick recipe for their breakfast, lunch box or for dinner. I am sure its a very healthy choice for kids and adults as well. 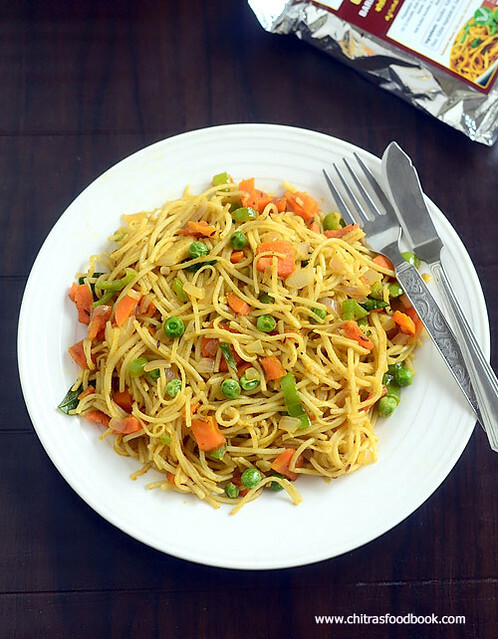 You can try varieties like hakka noodles, Schezwan noodles, vegetable Chinese style noodles and much more. I will try to make some interesting recipes with it and share here soon. I strongly recommend all my readers to try these products from their online stores. They deliver their products in Chennai, all over Tamil nadu, Karnataka and Andhra as of now.They told they will be expanding their service all over India very soon. 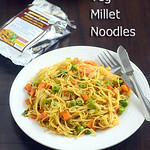 Now lets see how to make Veg Millet Noodles recipe with step by step photos ! 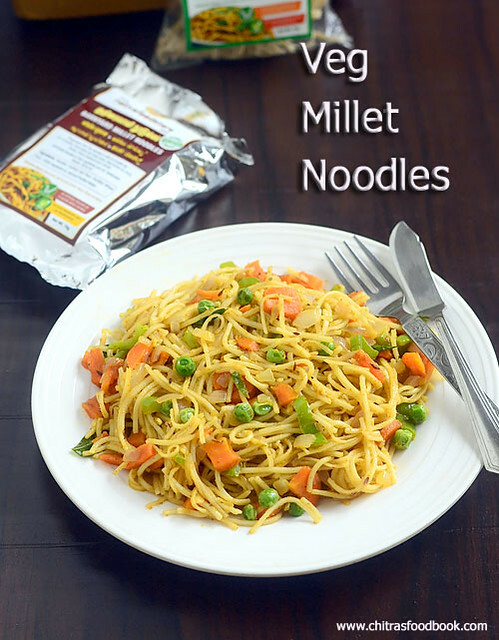 Veg Millet noodles recipe - How to make Millet noodles at home - Indian style ! Heat 2 cups ( 500ml) of water adding few drops of cooking oil and little salt.Let the water come to roll boil. Then add the noodles and cook for 12 to 15 minutes. In the mean time, you can chop onion and vegetables into small pieces and saute them to make the masala. In 12 minutes, noodles will turn soft but stays firm in shape.All the water will be evaporated. Now take one noodle and try to mash it. If it breaks and mushes, noodles is cooked soft. Switch off the flame and drain the noodles in a colander or sieve. Discard the excess water and wash the noodles in cold water. This helps to keep the noodles non-sticky and avoids excessive cooking. Heat 2 tbsp cooking oil in a kadai and saute the finely chopped onion,curry leaves and mixed vegetables. Add the salt required for vegetables and mix well. Add 1/2 cup of water and cover cook till the vegetables are soft. Boil and drain the excess water if any. Now add the tastemaker and mix well. Add the cooked noodles and toss it to coat the masala. Check for taste and add more salt if needed. Lastly sprinkle some lemon juice if you wish and mix well. Switch off the flame and serve hot immediately ! 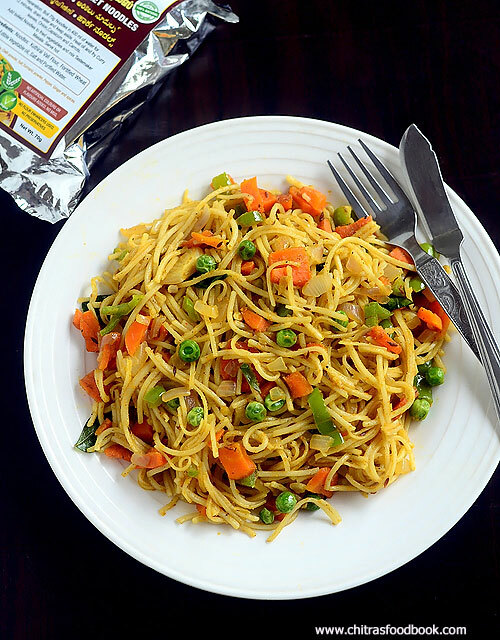 Try this healthy mixed veg millet noodles at home and enjoy ! What is this taste maker? Which brand should I look for. 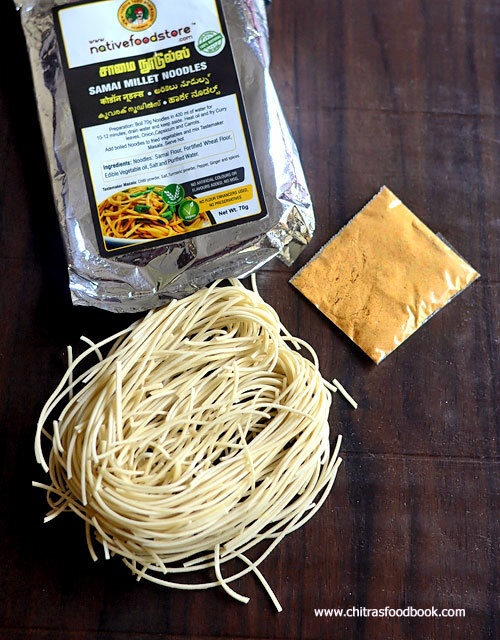 This tastemaker comes along with noodles.Buy the noodles online from "Native Food Store". Please visit their website for more details.You can use red chilli pwd + Garam masala pwd instead of tastemaker but tastes slightly different than the tastemaker.